On Sunday (July 29), I drove down along Road 21 past Hills Creek Reservoir, yet again. I believe that’s the 13th time this season—and it won’t be the last. It is such a fascinating area botanically with a few good trails and a great deal of roadside interest. I was still tired from bushwhacking around Bearbones Mountain, so I wanted to avoid any real hiking and to instead check up on some good roadside spots and see as much of Hills Peak, way out past the end of 21, as I had time and energy for. My first stop was to Youngs Flat Picnic Area to see if the piperias were in bloom. What great luck, the white-flowered royal rein orchid (Piperia transversa) was in perfect bloom. Chaparral rein orchid (P. elongata) blooms a little later and was just starting, although I found several in good bloom. As far as I know, it is impossible to tell the various species apart from the leaves. So this was the time to check out some of the areas along the road where I’d seen the leaves but never the flowers. So my next stop was Mutton Meadow. In the woods across the road from the meadow were some scattered Piperia transversa, no elongata. The meadow itself was filled with elegant cluster-lily (Brodiaea elegans), some kind of birdbeak (Cordylanthus sp. )—a rare plant around here, and yampah (Perideridia spp.). I believe I saw both P. gairdneri and P. oregana, but until the seeds appear, I can’t be sure. That’s a tough genus to get a handle on. Left and middle are Piperia transversa. It has mostly white flowers with long spurs that are perpendicular to the stem. On the right is the mostly green Piperia elongata. Its spurs are even longer and point in any direction. The lovely eastern tailed blue has bolder markings than the western tailed blue. Next stop was rather random, to see what was growing in a wet ditch. 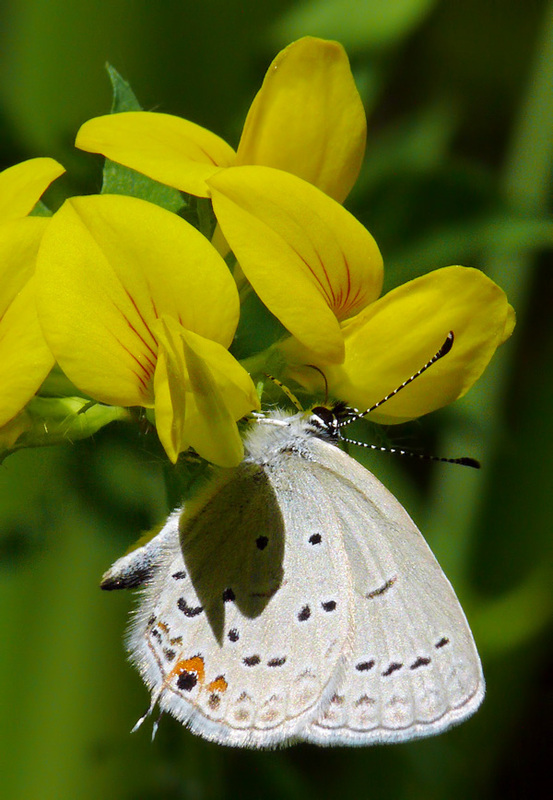 Mostly there was weedy Lotus corniculatus, but it had attracted a very fresh and pretty eastern tailed blue. As long as I was stopped, I looped around the back of the car and took a quick look in the woods. Again there were just scattered Piperia transversa, but climbing over the berm to the front of my car, there was an elongata and several transversa. If I had walked around the front first, I wouldn’t even have had to go in the woods. The place I really wanted to check was the meadow by Sacandaga Campground. I never stopped there until the last few years, but it has proved to have some interesting and attractive plants. As soon as I got out of the car, there were five clumps of indian pipe (Monotropa uniflora) and a single blooming leopard lily (Lilium pardalinum) in a small creek. I walked through the woods along the east edge of the meadow to where I had seen many Piperia leaves last year. It turned out to be a haven for both species. There were over 25 Piperia elongata flower stalks and almost as many transversa. It seemed the transversa were closest to the open meadow and the elongata were a little deeper in the woods, but the woods are very open here as they are at Youngs Flat. It’s nice to have that figured out. 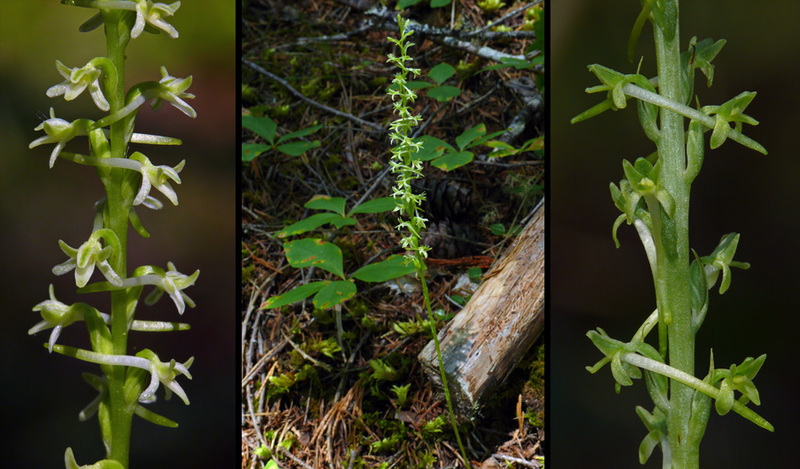 I don’t know why this area is so full of these seemingly rare orchids, but it is just another reason why I like this part of the Western Cascades so much. Next up was a stop at the corner of Road 400 where I found some giant chain fern last year. Sabine and I discovered this spring that there is a good-sized population of leopard lily here. I’d never seen it at such a low elevation—around 2500′. It turns out Bruce Newhouse had already located this population well over a decade ago. This gorgeous lily is at the northern end of its range in this area, not venturing north of Highway 58. The northernmost population on the Oregon Flora Project Atlas is one I found at Hemlock Butte a few years back. I hope we can relocate it on Friday on our scheduled field trip. It is also nearby along the Moon Point trail and the upper portion of the Youngs Rock trail. It is a real beauty, but if you’d like to try growing it, try collecting seed. Never dig! 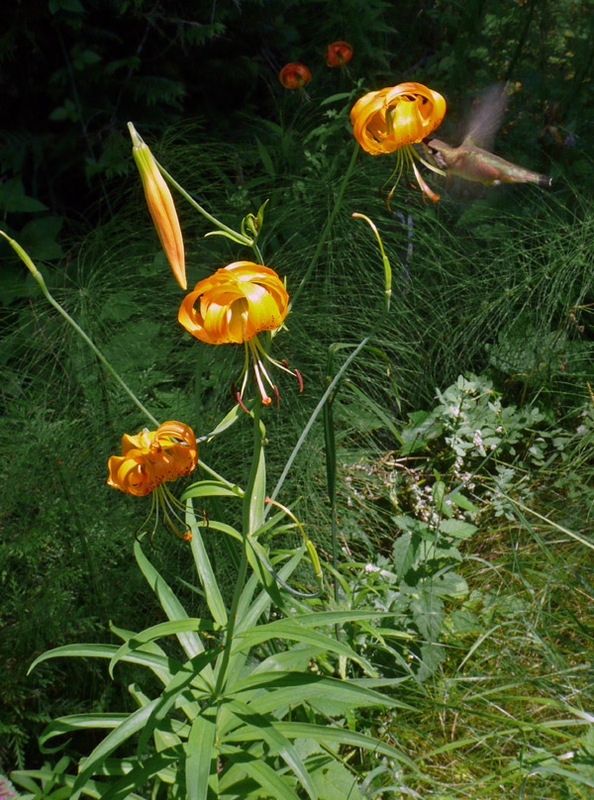 As I stood and photographed one of the plants that still had fresh blossoms left, a hummingbird dashed into the frame! I wasn’t really set up for it, so it isn’t the highest quality photo, but after all the hummers that have raced out of my view, it was still exciting to have one who actually came to me and let me get a photo. Please correct me if I’m wrong, but I believe these three willowherbs in the bog are, left to right, Epilobium hornemannii, E. halleanum, and E. oregonense. The middle one has been a mystery for a long time as no two references seem to agree on a description. Whatever it is, it is actually quite common in wetlands throughout the Western Cascades. After all these stops, worthwhile though they were, it was almost 4pm when I arrived at the wetland and small lake just west of Hills Peak. I wished, as always, that I’d been able to leave earlier in the morning, so I’d have more time. I decided to spend most of what was left of the day at the shallow lake and bog to the northwest of the peak. The mosquitoes were out, but the breeze mostly kept them at bay. I relocated a large area of pyrolas that I had seen on a previous trip but couldn’t remember which wetland they were in. There were hardly any even in bud, so it will take a return trip to photograph the uncommon Pyrola minor that I saw in seed among the larger but similar Pyrola asarifolia. Out in the bog, I was surprised at how early some of the plants were. A lot of snow must have collected along the south edge because there were very fresh mountain shooting stars (Dodecatheon jeffreyi), and some elephanthead (Pedicularis groenlandica) were still in bud. There were also a number of the adorable white Macloskey’s violet (Viola macloskeyi) still blooming. No sign of the later Gentianopsis simplex which was already up and in bud at Warfield Bog a week earlier, but then it is about 600′ higher in elevation. Of special interest to me were several species of willowherbs (Epilobium spp.) in perfect bloom. These are really tough to identify and are often left out of guide books. I’m still trying to sort them out. 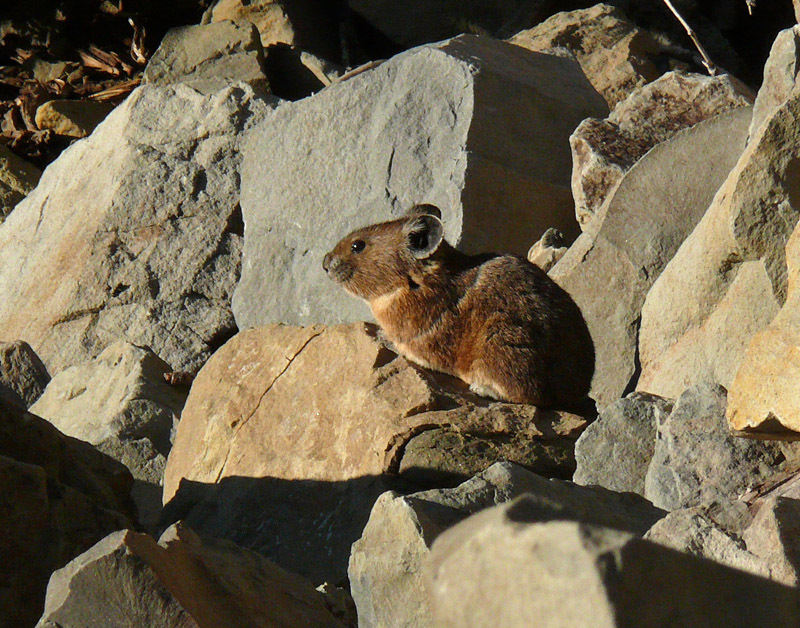 A pika hangs out in the setting sun near the bottom of the talus. Before heading home, I had to make a stop at the talus slope on the north side of Hills Peak. I sat down on the large rocks and ate a sandwich, waiting for my special friends to appear. First I saw a chipmunk. Cute but not who I was waiting for. Then a scurrying golden-mantled ground squirrel sent a few small rocks rolling down the slope. Then I turned my head, and there he (she?) was—an adorable pika. I got a few photos before he disappeared, but a short while later, another one popped up—or perhaps it was the same one wondering if I’d left yet. I wished I’d been able to camp there because I could hardly bear to leave. But the sun was getting quite low, so I had to say goodbye again. Maybe next time I’ll head straight to the slope and spend the whole day climbing around the base of the cliff and watching the pikas. Something to look forward to.